Tribal Yoga is my after-work oasis. The staff is very inviting and extremely knowledgeable. I always leave the studio feeling refreshed, relaxed, and satisfied knowing that I tried my very best for that day, and that my best was enough. The studio attracts people from all fitness levels. So whether you are a novice or a pro, I'm confident that you will enjoy developing your practice at Tribal Yoga. Everyone was super friendly!! The surf yoga was like no other class I have ever taken! It was so much fun and so challenging!! Everyone is always so engaged when we speak, which is hard to find, but greatly appreciated, from any customer oriented business these days. 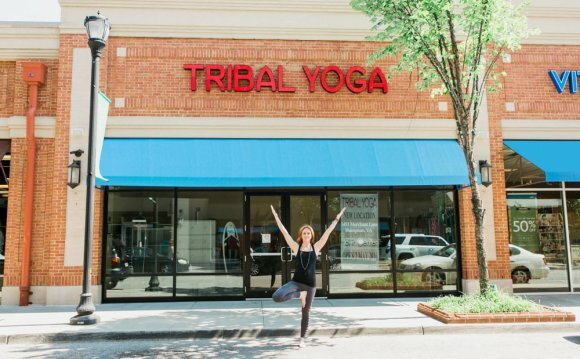 Yoga studios, and fitness centers in general, can be pretty intimidating, but Tribal is like a pair of wide open arms and a big smile! They've also got a great variety of classes, and a clean, warm atmosphere. I have been a member of Tribal Yoga for a couple of years. The instructors and staff are wonderful, and the class schedule offers a lot of variety for all skill levels. I'm so glad to have found this Tribe! There are different times available which can accommodate schedules as well as different instructors with different styles so we get a nice variety. Everyone from Sara in the front desk to all the instructors to the students are all great, friendly, and supportive. It is a great environment and the classes are great because they give you modifications to use if you're a beginner and so you can participate in every pose, and if you're more advanced you get to challenge yourself too. The vibe in this place is underwhelimgly calming! Sarah is very knowledgeable and I really felt like she made it easy to understand the moves and the way you were supposed to feel in that moment! Her studio is very well kept and clean and I love that she has yoga mats available for use. The times for the yoga classes are perfect in my opinion, theyre later in the afternoon for those of us who don't get off work until later! I will keep coming back! After checking out three studios, I decided to try out TribalYoga...and not a single regret! The staff are impressively knowledgeable and incredibly helpful with your practice. Varying class offerings push your practice to new levels. I can't pick a favorite, but I regularly enjoy pairing a yoga class with yoga barre, or SurfSet (think yoga on a SUP board without the water! ), or acro for ONE evening. Expect to work your body, get centered, And have fun! Namaste. The instructors are incredibly knowledgable and friendly. They provide a great stage to set goals and challenge yourself. I've just started with yoga so my opinion is that of a newbie. What I do appreciate about here are the 'beginner friendly' classes that are offered as well as the other different ones I look forward to trying as I progress and I absolutely LOVE how nice everyone is! The Yogis are awesome as they guide us through the practice. The studio is peaceful, clean and well organized. Classes are conveniently timed for after work. The location is easy to get in and out of with plenty of parking. Sarah always greets us with a smile. And most of all, the tribe is wonderful-it's a great place for making friends.